Step out of the city life by going to Dubai Creek and Marina Beach. Your inner history buff will appreciate Qasr Al Hosn and Bastakia Quarter. Explore the numerous day-trip ideas around Dubai: Abu Dhabi (Emirates Palace, Corniche Beach, & more). Next up on the itinerary: get engrossed in the history at Al Fahidi Fort, explore the striking landscape of Dubai Desert Conservation Reserve, cool off at Wild Wadi Water Park, and stroll through Jumeirah Public Beach. To see ratings, where to stay, maps, and tourist information, refer to the Dubai tour planner. If you are flying in from United States, the closest major airports are Dubai International Airport, Sharjah International Airport, Al Maktoum International Airport and Ras Al Khaimah International Airport. 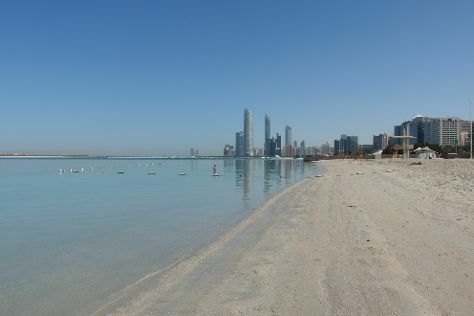 In March, daytime highs in Dubai are 84°F, while nighttime lows are 68°F. Cap off your sightseeing on the 31st (Fri) early enough to travel back home.